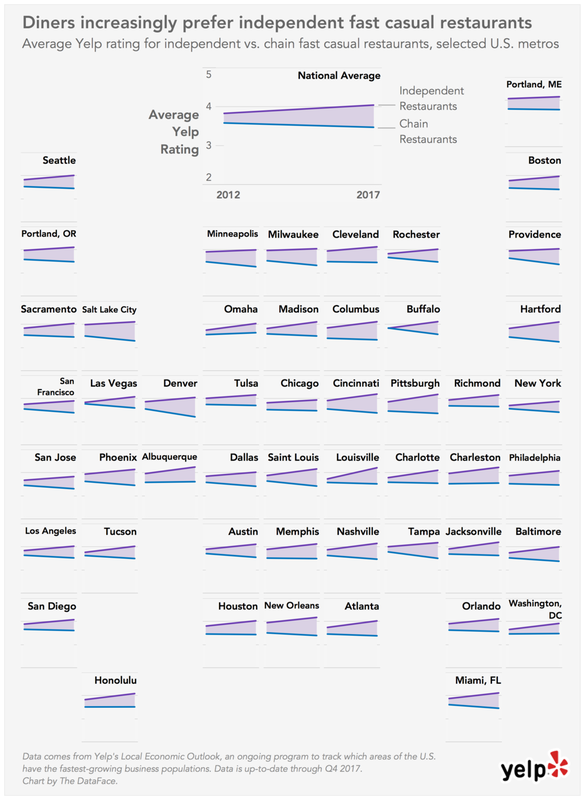 Tuesday, Yelp released the second edition of their Local Economic Outlook, ranking U.S. metro areas by the pace of growth in their local-business population. Using their deep data stores, Yelp analyzed review ratings for chain and independent restaurants in the 50 metro areas included in the outlook. The research indicates a shift in consumer perceptions of restaurants. Citing the “celebrity-chef” movement, the data shows a tremendous rise in in independent restaurants over the last 5 years. Comparatively, fast food restaurants have seen a notable decrease in average ratings, about 16% between 2012 and 2017. While chain restaurants across the country encounter increasingly choosy diners, independent fast-food and fast casual restaurants have seen a continued increase in average ratings, improving by 7 percent in the last five years. Ratings for casual-dining chain restaurants held up better, unchanged on average, though they lagged behind their independent competitors, which gained a quarter of a rating point between 2012 and 2017. It’s important to note that while many people might associate the phrases “fast food” and “fast casual” with chain restaurants, many restaurants that provide that type of experience are independent. The data shows that the type of restaurant (fast-food, fast casual, or casual) is much less important than their appearance as either a chain or independant restaurant. Visit “Yelp” to see how the 50 major U.S. metro areas compare in local-business success throughout 2017 including which business categories are growing fastest, how restaurants compare and how diners in the metro rate chains and independent restaurants.